As you are reading this post, I assume that you are interested in earning extra income or looking for side jobs/business ideas. Making extra income has become very important nowadays. The cost of living is zooming up, lifestyle expenses are increasing, and it is becoming difficult to survive with a single income source. If you are running short of money every month, you should start working on building extra income. To help you here are 15 Best Side Jobs for making extra income. These side jobs can help you to earn decent income by working only for a few hours. The list contains both online and offline side jobs. You can select the job based on your convenience. Online Tutoring is one of the best side jobs to earn extra income. You can earn decent income from this job in the part-time. Online tutoring is becoming one of the emerging career options in this decade. You can start online tutoring in three different ways. Starting your own website – In this method, you need to start your own website and make subscription-based learning model. Starting YouTube Channel – You can create paid YouTube channel and share your educational video online. From Online Teaching portal – There are multiple online teaching portals such as Cuemath, Vedantu etc. You can join this portal and begin your side job as a tutor. Blogging is one the lucrative idea of earning extra income. Blogging means publishing an article or updated content on specific topics at regular interval. If you are an expert in the specific subject you can think of becoming part-time blogger. Blogging is becoming a popular career option nowadays. There are two ways to start blogging. Starting Free Log on Blogger – A first option is to start blogging via a free platform of blogger offered by Google. Starting Blog/Website – The second option is to start your own website/blog by purchasing the domain name. You can use a content management system such as WordPress. Once your blog becomes popular you can either use paid subscription model, direct advertising or Google AdSense to make money from your blog. Affiliate Marketing next in the list of side jobs for earning extra income. In this idea, you need to increase sale of associated products. You can use email, WhatsApp or SMS marketing for this. If someone buys a product via you, you will be paid a commission. Mostly all online store including Flipkart, Amazon offers affiliate marketing membership. Your commission level depends on commission rate. Starting a YouTube Channel is another lucrative side job for earning extra income. In this idea, you need to create unique videos and post it on your channel. For creating a video, you can take help of readymade animation software. Another alternative is to use a high-quality camcorder for making videos. The posted video will be monetized by showing advertisement under YouTube channel partner program. Alternatively, you can also make your channel as a paid channel and earn a lot of money. 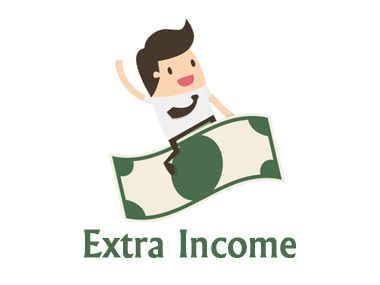 One of the simplest ways of earning extra income is by joining Data Entry Jobs. In data entry job you need to see images and prepare word file according to text written in the image. This type of freelance jobs required a commitment to complete certain pages in a day. You need good typing speed to start data entry jobs. There are many websites which offer data entry jobs online. A freelancer is a person who is engaged in completing a specific job or project. It is a very good side job which can be started without investment. You just require special types of skillset and time to complete freelance jobs. There are plenty of freelancer jobs available online. You can select job-based on your interest and skill set. You will be paid based on project type and quantum. Next side job is becoming virtual assistant. A Virtual Assistant manages a simple task such as writing an email, copying data, editing files etc. These tasks can be done online and even from home. You need to have basic knowledge of computer to start acting as a Virtual Assistant. There are many websites that offers a virtual assistant job. Stock Market Trading is very good idea for earning extra income. In stock market trading you need to buy and sell stocks in the short interval of time for generating cash. It is comparatively risky idea. This idea also requires money for investment. You have to be stock market expert in order to generate money via Stock Market Trading. Real Estate Agent is a very good side Job for earning extra income. In this job, you need to help people in buying, selling or renting properties. You can make use of property website for getting contact detail of buyer and seller. You can earn good commission via this method. An insurance agent is one of the best ways to generate an alternate source of Income. As an insurance agent, you need to sell insurance policies. You will get a commission on the sale of each policy. This idea is suitable for people with a marketing background. Starting a part-time tuition best way to earn extra income. This can be started even from home with little investment. There are two different way to start tuition. First is to start giving home tuition by visiting student’s home and second is starting group tuition at your place. You have to be very good at teaching for starting tuition. Network marketing or multilevel marketing is next in the list. In this idea, you need to create members under you for selling product and services of MLM Company. There are two ways to generate money from this idea. First is via regular commission income on the sale of a product. Second is earning a profit on product sale. If you have the skillset of mobile repairing you can earn a lot of extra money. It is recommended to do a course of mobile repairing before entering in mobile repairing. You just require kit of mobile repairing. You require a small space to start mobile repairing. Babysitting is specialized job for women. Your task here is to keep a child for a few hours or for an entire day. You need to make investment to start this job. There are many working women looking for good babysitting service provider. Photography is another lucrative career option. In order to do this job, you need to have a skill and sound knowledge about photography. You can sell your photos online or set up your own website for promotion. « NPS Statement & Account Balance – How to Download?